Christian Research Network is a sister work of Apprising Ministries. Sadly, The Alpha Course (TAC) is making a comeback. CRN associate editor Erin Benziger told us earlier that The Alpha Course Receives Praise From Moody Radio’s Janet Parshall. 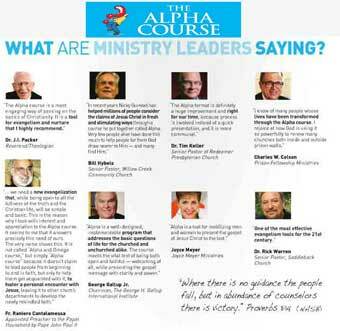 Based upon a speaker at an upcoming Desiring God conference, who literally teaches TAC at his church, I wondered: John Piper Approves Of The Alpha Course? A fair question becauseI showed you TAC comes with endorsement from some around Piper. In the article, “The Ecumenical Compromise of The Alpha Course,” it was noted that, “CRN has been informed by a leader within Alpha for Catholics that, ‘It is not necessary to change the Alpha course for Catholics.’” Indeed, this reality has been affirmed time again, most recently by Gumbel himself in the aforementioned article found in The Spectator . Contrarily, Scripture teaches that man’s deeds are as filthy rags before the Lord (Isa. 64:6), and that men are saved not by works of their own hands, but by the grace of God (Eph. 2:8–9). This is just one of numerous contradictions that exist between biblical, orthodox Christianity and the doctrines of the Roman Catholic Church, yet it is a fatal one. Its reality means that Rome stands in opposition to God’s Word, and thus to God Himself. It seems irrefutable, then, that Nicky Gumbel would affirm that an apostate denomination, the Roman Catholic Church, is part of the true Body of Christ. Yet, how can such a group be a part of the true Church when it denies the basic tenets of salvation that offer one entrance into that true Church? Christians cannot knowingly and willingly walk alongside those who are enemies of the Gospel in supposed gospel efforts. Gumbel’s affirmation of the Roman Catholic Church as part of the true Body of Christ reveals that he either is ignorant of the true gospel, ignorant of the doctrines of the Roman Catholic Church, or is aware of both and yet chooses to ignore and deny the truth in favor of peace and unity. Yet, in the end, Christ cannot have fellowship with Belial (2 Cor. 6:14–15).